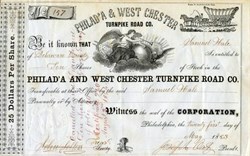 Beautiful certificate from the Philad'a & West Chester Turnpike Road Company issued in 1853. This historic document has an ornate border around it with a vignette of an angelic woman blowing on a horn and a conostoga wagon. This item has the original signatures of the Company’s President, and Secretary, and is over 159 years old. The Red Arrow Lines of Philadelphia had its origin in 1848 as the Philadelphia & West Chester Turnpike Road Co., which operated a plank toll road between Philadelphia and West Chester. 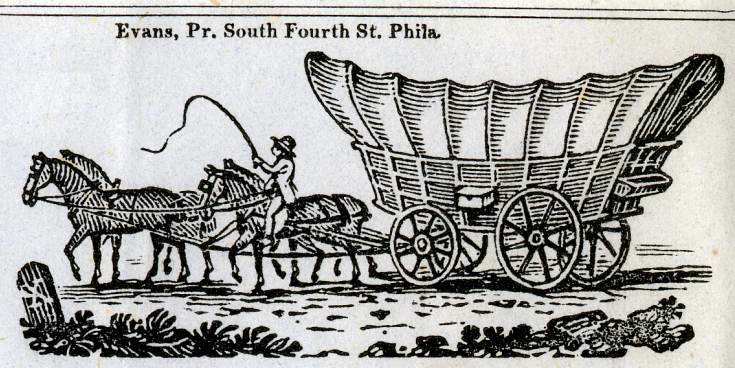 In 1859, the Delaware County Passsenger Railroad opened a horse car line from 39th Street and Market Street in Philadelphia west to Penrock Avenue, but the line closed in 1865. The Ardmore & Llanerch Street Railway opened in 1902 between those points. And in 1904, the first segment of the Philadelphia & Garrettford Street Railway Co. opened. The Philadelphia & Garrettford Street Railway Co. included lines to Sharon Hill and Media, the only Philadelphia & West Chester Traction Co. lines which continue to survive as electric railways. In 1936, the Philadelphia & West Chester Traction Co. and all leased companies were all merged into the Philadelphia Suburban Transportation Co. which became known as Red Arrow Lines. In 1951, the Philadelphia & Western Railroad Co. was acquired. Delaware County Passsenger Railroad - incorporated 1859, controlled 1895 by Philadelphia & West Chester Traction Co.
Philadelphia Castle Rock & West Chester Railway - incorporated 1892, controlled 1895 by Philadelphia & West Chester Traction Co.
Ardmore & Llanerch Street Railway - incorporated 1901, leased 1902 to Philadelphia & West Chester Traction Co.
Philadelphia & Garrettford Street Railway Co. - incorporated 1904, leased 1906 to Philadelphia & West Chester Traction Co.
Philadelphia & Western Railway Co. - incorporated 1907, reorganized 1946 as Philadelphia & Western Railroad Co., sold 1954 to Philadelphia Suburban Transportation Co.
Aronimink Transportation Co. - incorporated 1923 as bus subsidiary. SEPTA acquired the Philadelphia Suburban Transportation Co. in 1970. Under SEPTA, the operations are known as the Victory Division.